Green walls, also known as living walls, biowalls, and vertical gardens have become a prevalent feature in today’s interior design. Incorporated into a space, they instantly raise the aesthetic value and are a magnet for meeting and collaborative spaces. Blondie’s can assist you in specifying the correct system and design a wall that will flourish. Upon completion we work with you to develop a maintenance strategy that will guard your investment and keep the planting looking its best. Due to the chemicals found in things like carpeting, wall paint and electronics, many people do not realize that interiors can be more polluted than the exterior environment. 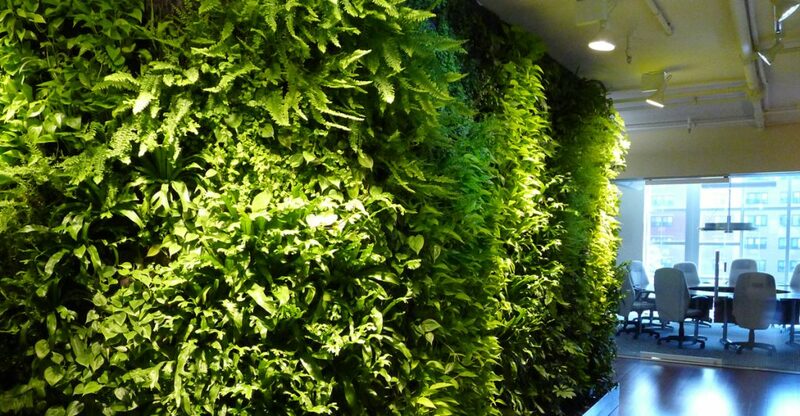 Green Walls assist in cleaning the pollutants out of the air and help regulate temperature and humidity levels. They help to improve the health and well-being of those around them and are a magnet for meeting and collaborative spaces. To begin the process, one of Blondie’s landscape designers will conduct an on-site walkthrough of your space to discuss the Green Wall system that will work best for the specific site conditions. Blondie’s will guide the project knowing how to discern the correct system for each location. It is our knowledge based on years of experience that is the foundation of every successful Living Wall project. The micro-climate of a Living Wall is a very particular environment. Selecting the correct plant palette is a key to success. Based on the conditions of the site and the look and feel of the wall, Blondie’s will be able to select plant material that will thrive. Through years of experience we have developed certain plant families composed of plants that do well together in a vertical garden setting. 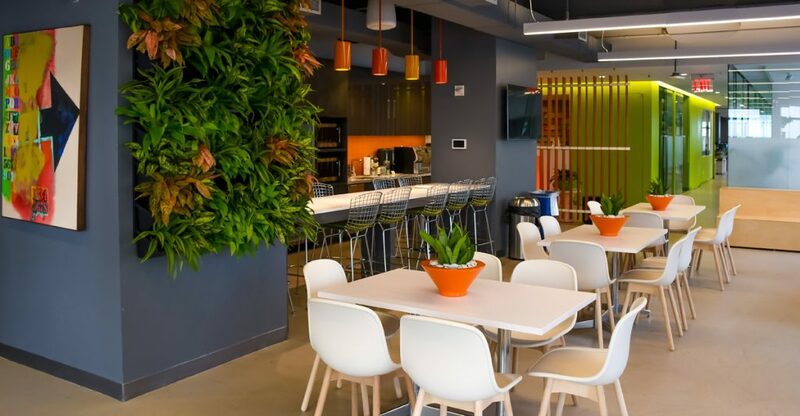 The installation of your Green Wall system will be coordinated and scheduled. Our trained professional installation team will work efficiently insuring the least amount of disruption as possible. Green Wall systems need to be constructed methodically, each stage requiring full attention to detail. Blondie’s understands how to install, monitor and inspect the installation of this multiple layer process. Managing the project also means coordinating with everyone involved and keeping an accurate schedule. We will do all this while providing updates and maintaining clear and open communication. 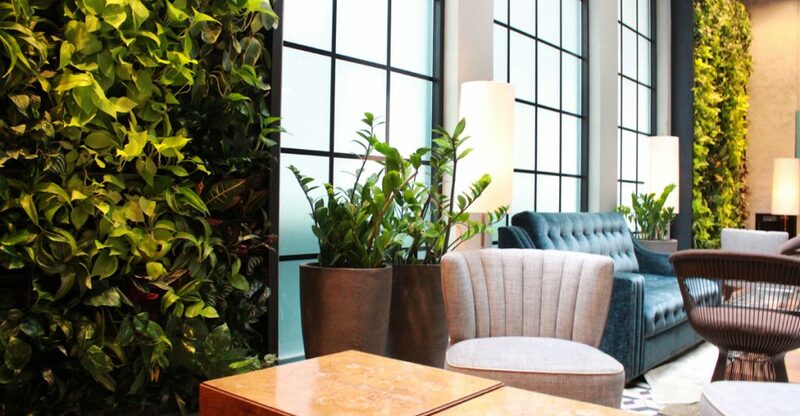 The proper maintenance of your Interior Green Wall will guarantee its success. Our Technicians are trained on keeping walls healthy and problem-free, within the unique environment of your interior space. You will see them not only spot watering and fertilizing when needed but also trimming, cleaning, and inspecting the system’s structure and irrigation components. 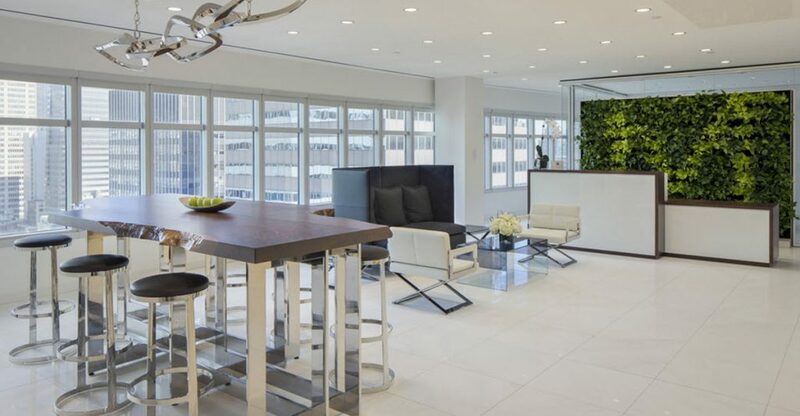 The new Garden Room in the 151 West 42nd Street 45,600 square foot amenity space features a floor-to-ceiling green wall. 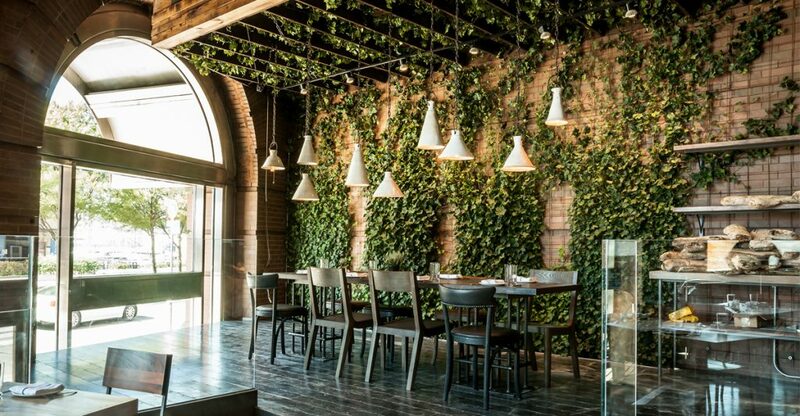 This impressive custom curved green wall is approximately 975 square feet and features 12 species and 20 varieties of plants totaling over 2,200 individual green plants. 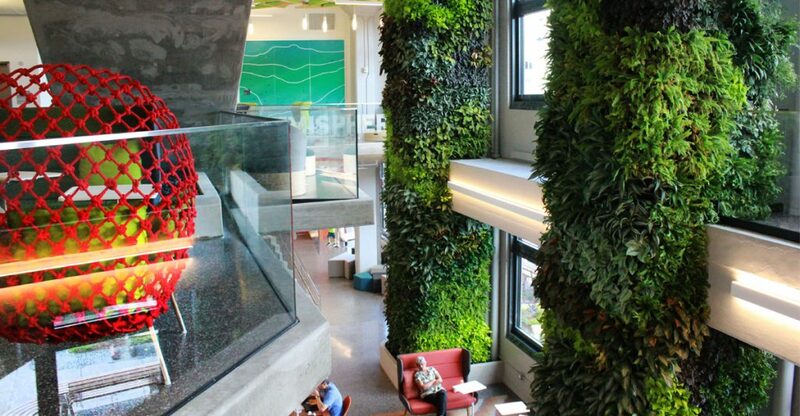 Located in Manhattan’s Chelsea neighborhood this Tech Company is home to 2 impressive 40 foot tall green wall columns. With green plants completely covering 3 sides of the columns 132 custom fiberglass plant trays were installed and hold over 2,820 plants. 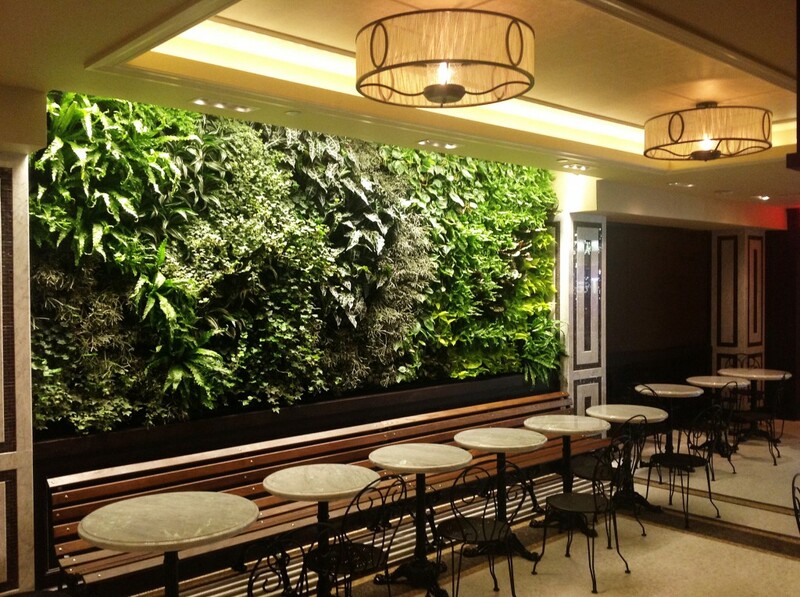 With the expansion of the Todd English Food Hall on the concourse level of the Plaza Hotel, Blondie’s has designed and installed a 6 x15-foot living wall that is incorporated into the hall’s dining area. 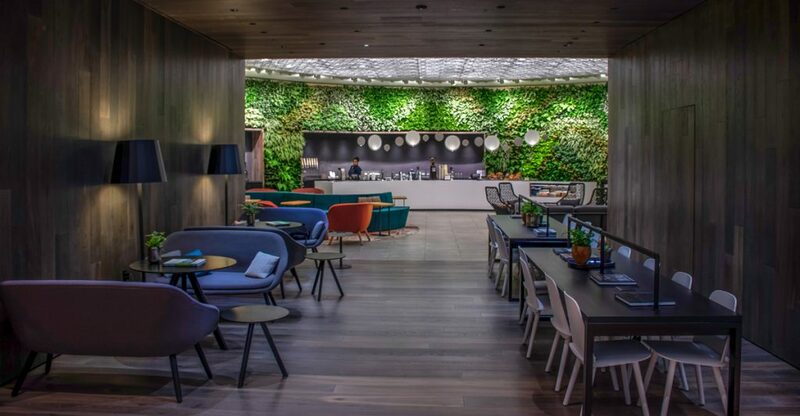 Composed of a textural palette of variegated foliage and seasonal color, the greenwall creates a sense of fresh air and is a nod to the nearby Central Park. Blooming plants within the wall are rotated to introduce color that reflects the changing of the seasons. The success of the lighting design acts to highlight and accentuate the wall as well as provide the necessary light levels that the plants rely on to thrive. 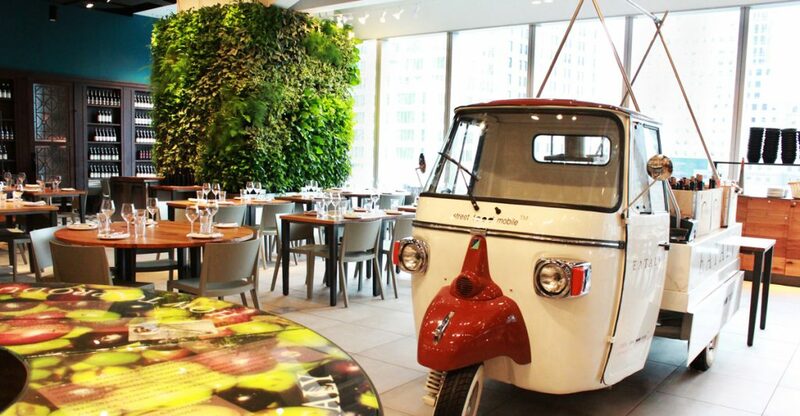 Blondie’s manages and provides regular horticultural service which guarantees that this living wall will remain in top condition and one of the main attractions to this foodie paradise. The fiber pockets of this system are mounted onto a structural wall and then soil media and plants are added. A main consideration of this wall variety is substantial waterproofing and proper irrigation. After the wall has been successfully installed a wide variety of plant material can be used. Using grids or troughs to support potted plants, these systems rely on a wicking material to deliver water to the plant material. This is a great system for seasonal rotations as it does not require any grow in period. A extensive variety of planting options are available. This system is made up of modular units planted with supports to keep in the grow media. This is an excellent decision for highly designed walls with an estimated grow-in period of 3 months. A main consideration is the complexity of the irrigation system as well as the heavier weight load this Living Wall necessitates. Self-contained systems available in a wide variety of sizes, picture planters are living works of art. Hung on the wall in much the same way, they contain troughs or pockets for individual plants and a closed irrigation system. Horticultural service is similar to the average potted plant’s requirements.